We reported an exclusive four months back about Samsung working on a Galaxy C5 Pro and Galaxy C7 Pro, and famous import tracker site Zauba has already leaked the device model number (SM-C5000), which means that the device itself exists. Then, the Galaxy C5 Pro received its TENAA China certification and WiFi certification as well. Of course, the usual trail of leaks consist of model numbers, benchmarks, and specs, which means that photos are soon to leak thereafter. And today, we have just that: a photo leak. 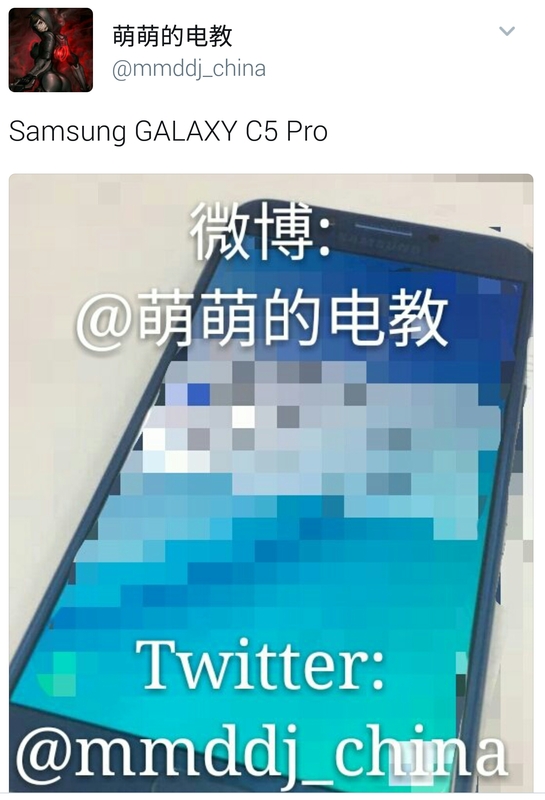 The leak comes to us by way of @mmdj_china, who has now leaked the very first photo of the Galaxy C5 Pro to the public. Similar to the rest of the Galaxy C series, the device will retain its home button and have thin bezels. The traditional “SAMSUNG” branding up top remains. Since the display of the photo is blurry, and while we can make out that blue will be one color offering for the handset (alongside of gold and pink), we can’t make out any additional details. The leak has been supported by Twitter member @slashleaks. What we do know about the Galaxy C5 Pro comes from Indian import tracker Zauba and the TENAA, but the reports are still conflicting at this point. Zauba said the C5 Pro would have a Snapdragon 625 SoC while the TENAA has certified the handset as having a Snapdragon 626. Zauba reported that the handset would have 3GB of RAM while the TENAA certification reports 4GB of RAM alongside of a 5.2-inch, Full HD Super AMOLED display with a 1920 x 1080p screen resolution, 16MP front and back cameras (matching the 2017 Galaxy A series), a 3,000mAh battery, and Android 6.0.1 Marshmallow pre-installed. The Galaxy C5 Pro is set to arrive with the Galaxy C7 Pro this month after having been delayed their December 2016 release in China. More like “Delayed, but not derailed”?